I was assigned with the Ashram’s legal work as in-house lawyer from about January 1998. I was attending to Ashram’s legal matters usually along with senior counsels Sri R. Padmanabhan and Sri C.S. Narasimhan. Approximately during September-November 1999, Manoj Das Gupta Ashram Trustee, Purushotham Iyengar and Matri Prasad who are like secretaries to the Trustees (actually there is no designation or hierarchy in the Ashram as such except for administrative responsibility as a departmental head or a Trustee) approached me and informed me that we have to meet Harikant C. Patel, the then Managing Trustee, with regard to some purchase of properties. I went along with them to Harikant C. Patel who was in the Ashram Nursing Home in the beach road due to hip-bone fracture. Harikant started the meeting and told us that there is one building known as ‘Ragavan House’ on the Junction of St. Louis Street and St. Gilles Street. He said it is a place where Sri Aurobindo lived and Ashram has been enjoying the property as a tenant for the last about 30 years. That the Ashram now desires to purchase the house. 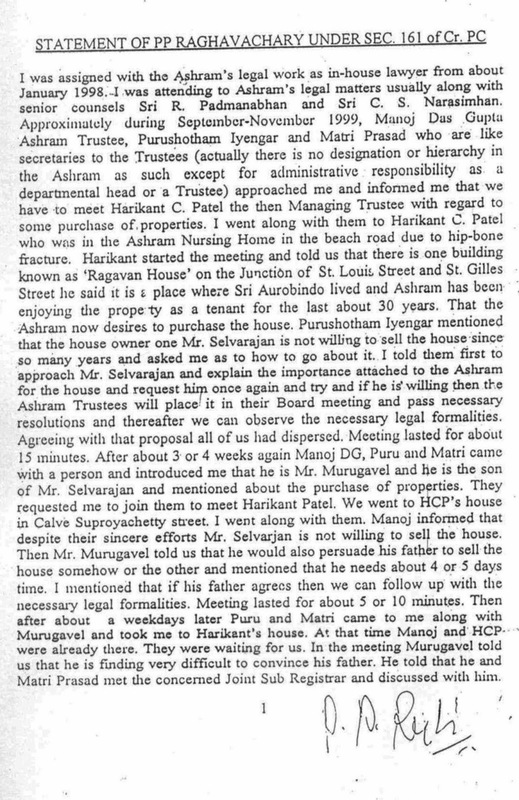 Purushotham Iyengar mentioned that the house owner one Mr. Selvarajan is not willing to sell the house since so many years and asked me as to how to go about it. I told them first to approach Mr. Selvarajan and explain the importance attached to the Ashram for the house and request him once again and try and if he is willing, then the Ashram Trustees will place it in their Board meeting and pass necessary resolutions and thereafter we can observe the necessary legal formalities. Agreeing with that proposal all of us had dispersed. Meeting lasted for about 15 minutes. After about 3 or 4 weeks again Manoj DG, Puru and Matri came with a person and introduced me that he is Mr. Murugavel and he is the son of Mr. Selvarajan and mentioned about the purchase of properties. They requested me to join them to meet Harikant Patel. We went to HCP’s house in Calve Suproyachetty Street. I went along with them. Manoj informed that despite their sincere efforts Mr. Selvarjan is not willing to sell the house. Then Mr. Murugavel told us that he would also persuade his father to sell the house somehow or the other and mentioned that he needs about 4 or 5 days time. I mentioned that if his father agrees then we can follow up with the necessary legal formalities. Meeting lasted for about 5 or 10 minutes. Then after about a week days later Puru and Matri came to me along with Murugavel and took me to Harikant’s house. At that time Manoj and HCP were already there. They were waiting for us. In the meeting Murugavel told us that he is finding very difficult to convince his father. He told that he and Matri Prasad met the concerned Joint Sub Registrar and discussed with him. He said that Joint Sub Registrar gave the idea that he would register the settlement deeds in his favour if he or Matri or any other person can sign like his father (RKS) and arranges some amount for him and that he would dispense with the presence of Selvarajan and also the thumb impression and thereafter he could sell it to the Ashram. He told Murugavel to get the Gift Settlement deed ready. Hearing this immediately I rejected the proposal and gently explained to Murugavel that we in the Ashram cannot do this type of activities. Murugavel told us that he would take care of all that himself and it is not difficult. Manoj told me ‘What type of lawyer you are?’ He told that Ashram should somehow or the other buy that house because it is a place where Sri Aurobindo lived. Puru told us that the means is not very important, that is to say, that how we purchase is not very important but our concern should be focussed for the end. HCP also stressed the importance attached to the house and told me to co-operate. I totally opposed with this proposal and discouraged all of them and told them that being in the Ashram we should not indulge in this type of back door methods. Then Manoj and Harikant stated that if you do not agree then we will look into that. You can attend to the other matters. Thereafter I was kept in dark as to what happened. I came to know for the lst time from Ashram dispensary that something about the house grabbing column had appeared in the Indian Express. I was shocked. I heard that some news item and interviews also was broadcast regarding this house grabbing. I asked Harikant C. Patel regarding the damaging news items in papers and in TV. He told me everything is alright and the reports are all false. He said they purchased the property properly and nothing to worry about it. I asked them to show me the documents for which he told me that they are taking care of it and that I need not worry about it. Thereafter many other disciplinary matters and Ashram Inmates’ Association matters they messed it up. I could not tolerate the attitude of the Trustees for long because they were always suppressing the information. Therefore I withdrew (resigned) from Ashram’s legal work. In my withdrawal letter I wrote specifically that they kept me and our counsels Mr. Padmanabhan and Narasimhan in the dark which resulted in lot of damage to the reputation of the Ashram. Ashram Trustees never replied to my letter.